Searching for stylish hardwood flooring? Trust our flooring store for the best hardwood flooring prices, giving you the opportunity to invest wisely in the value and appearance of your home. The professionals at our store have the experience and equipment to complete hardwood floor installation projects of every size. Let us know if you are interested in engineered or solid hardwood flooring and we will provide you with a free estimate on the cost of a new installation. Your floor has to stand up to heavy foot traffic, spilled drinks, and bits of food. You want it to look attractive, but it also must be resilient. The quality hardwood floors available at our store offer an excellent blend of aesthetic beauty and functionality. Make us your first choice if you want fair hardwood flooring prices on top flooring brands such as Downs Performance™ and Floorcraft™. Not only do we boast premium hardwood flooring products, we have honed our installation skills to provide meticulous results for both engineered and solid hardwood flooring. Come by our showroom to see what hardwood flooring we have to offer. With our breadth of experience, you can trust us to give you the customized treatment you expect. We feature an expansive inventory at our flooring store, so you are sure to find just what you need. Once you settle on the product you desire, you can count on us for expert flooring installation services. Whether you’re completely remodeling your home or simply need a section of damage patched up, our professionals provide the detailed hardwood flooring installation services you require. Our flooring replacement services skillfully restore your floors as well as the investment you’ve made in them. We have the materials and experience to handle all of your requirements on the job. Traditional solid hardwood flooring is well known for the warmth of its appearance. A great way to increase the worth of your home, this flooring option can age beautifully if treated properly. That’s why you should only trust seasoned professionals with its installation and care. Our hardwood flooring contractors make sure your solid wood floors are properly sealed and maintained. Engineered wood, on the other hand, doesn’t require as much care. Each piece of this flooring is made from up to ten layers of wood. They’re fixed together in a specific technique to achieve unique widths to suit any home. 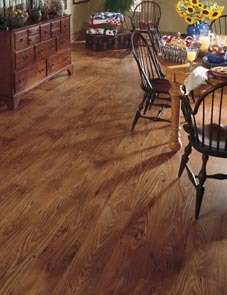 The top layer is made of real hardwood, giving the surface of your floor an authentic appearance. A perfect choice for basements and bathrooms, engineered hardwood flooring is resistant to water and humidity more than its solid counterpart. Contact us today for an unbeatable deal on premium hardwood flooring. We proudly serve customers in Sullivan, IN, as well those within a 20-mile radius.